MASTER PROBLEMS Parenting and Kids How to teach children to be tidy? How to teach children to be tidy? 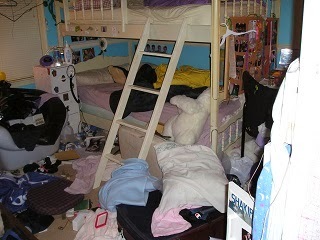 Do your children usually messy up their rooms by throwing down clothing and other items haphazardly? If you do not pick up these things, do you find that their rooms usually remain a mess? You may be wondering how you can make them keep their rooms or house in reasonable good order." Here are some suggestions which can help you know how you can deal with the problem. Discipline is defined as instruction and exercise designed to train to proper conduct or action. This training, in this case for neat habits, should begin early in life. The longer a parents waits, the more difficult it will be. But can children absorb such teaching at a very tender age? By the time the child is four or five years old, the child has pretty well mastered the basic uses of a complicated language. Surely that same mind can over the course of a few years, master the art of not being messy. Yes, if children can be taught within a few years to speak, read and write, then they can also be taught to be tidy. It is all a matter of discipline, training in proper conduct and action. Parents who take the time to train their children early in life will reap great benefits. In the long run they will save themselves trouble and heartaches. For as their children grow up, their neatness will become habitual and part of their pattern of life. Parents will discover that they will have to take less time disciplining their youngsters in this matter as they grow up. When parents learn to pick things up and put things where they belong, then they will have taken a giant step in teaching their children to do the same. This is because the right example is one of the best ways to teach. But what about parents who do try to set a good example in this matter, but whose children are still “litter bugs” because of the bad examples they see in the neighborhood or school? Here too parents must also bear the responsibility of disciplining their children. Parents cannot expect their children to do automatically what is right just by following their good example alone. Why? This is because there is a tendency towards wrong doing in children. That tendency will become even more pronounced if children are left without guidance where right and wrong are concerned. That is why young ones need discipline, and even punishment at times. In fact, even well trained children will have lapse in their good conduct at times. This because they are still children and cannot be expected to behave like a well-disciplined adult. But a gentle reminder will usually serve to correct the situation, though at times sterner measures may be taken. From when the child is very young, the parents can explain that it is wrong to throw things about and mess up their room, house or yard. They can be taught that there is a proper place to put litter, and there, and only there, is where it belongs. The children need to be told that there is a time and place for everything. There is a time to take toys out to play and there is a time to put them all back. There is a time to take books of shelves to read and time to put them back. There is time to put on clothes and there is time put them back in the closet or in the laundry bag. There is a time to eat and a time to clean up the refuse. Certainly, it takes time and patience to get over these various points and ideas to children. Parents may have to mention these things dozens, perhaps hundreds of times, over and over again. But after a number of months and years, the child will get the point and apply the training to put things where they belong. This all takes time and effort, but if not done the child will probably never learn the right habits. What if the child fails to obey oral instructions deliberately? Well, part of disciplining involves correcting. When a child fails to obey even though he or she understands and is capable of following directions, the parents should take corrective measures. This can be done by perhaps denying something of value or in the case of small children some spanking may be in order. Remember, the place to begin to correct matter is right at home with parents. There the young ones should begin to learn and put in practice proper standards of neatness. Parents can have the great satisfaction of knowing that they have produced good results of instilling good tidy habits in their children. This will be a genuine contribution to the upkeep required in a home. It will lessen the burden of cleanup required for the parents as the young ones will assist in keeping the home tidy, instead of parents having to do it all. So, make it your job to train your children in the value of being tidy.